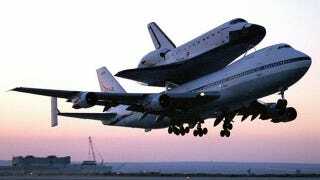 Next month, the retired space shuttle Endeavour will be making a 12-mile journey to its final resting place at a Los Angeles museum. But to get there, local officials will have to make way for the 112-foot-long, 78-foot-wide, and 5-storey-tall behemoth. And in order to do so they'll have to remove 400 trees, and hundreds of utility poles, street lights, and traffic signals. Needless to say, the locals are restless. And indeed, the $10 million dollar plan to move the shuttle to its final destination has been met with opposition. Though the cost was paid through by donations, local citizens aren't thrilled about seeing so many trees chopped down — not to mention the inconvenience it will cause. But to that end, the organizers have promised to re-plant 1,000 trees after the shuttle moves through. They say that none of the trees scheduled to be chopped down is a native species or "heritage tree," and that the replacements will be as much as 10 to 14 feet tall. As for the inconvenience factor, locals will just have to grin and bear it. Endeavour is scheduled to make its way through Los Angeles on October 12. Before that time, the organizers will have to remove trees and other obstacles. Crews have been working to raise the height of above-ground power, phone and cable lines that run horizontally across the shuttle's path. More problematically, there are three sets of high-voltage lines that cannot be permanently raised and will instead have to be removed and replaced one at a time. And to accommodate the Endeavour's 75-tons, special steel plates will be laid on the ground in front of the shuttle to protect the pavement from the stress. It's expected that Endeavour will be on public display as early as October 30. Images Carla Thomas/NASA, Fred Prouser/Reuters.